SARASOTA — The battle over the shuttered and decrepit Colony Beach & Tennis Resort continues with another lawsuit. Condominium owners Andy Adams and Sheldon and Carol Rabin are challenging the validity of the Town of Longboat Key’s emergency demolition order issued May 31. The suit also questions the constitutionality of the application of the town’s demolition code in this case. The suit seeks a temporary injunction to stop the town from proceeding with the order until a hearing is held before the 12th Judicial Circuit Court. That hearing is scheduled for Wednesday. The lawsuit filed Friday by the Law Offices of Lobeck and Hanson contends that the town’s emergency demolition code violates the plaintiffs’ due-process rights and “constitutes an impermissible taking of their property without adequate and proper notice and an opportunity to be heard.” The order stipulated that demolition could occur on or after June 15. 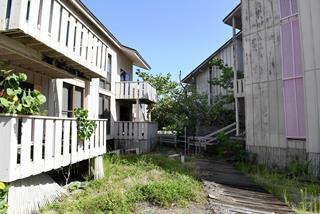 Andy Adams owns 70 of the property’s 237 condo units under his Colony Beach Investors LLC. The Rabins own two. Longboat Key issued the emergency order for the buildings at the vermin- and termite-infested resort after deeming the condos to be “unsafe and unfit.” The town commissioned an independent engineering firm to examine the buildings on three occasions, and the reports stated that the Colony site was a public nuisance with dangerous structures in unsafe conditions. Once a world-class destination, the Colony collapsed in a legal quagmire about a decade ago, was closed and continued to deteriorate. As required by the town demolition code, the building official and fire marshal determined the conditions of the structures threatened the public’s health, safety and welfare. But the owners’ lawsuit argues that “imminent” danger to citizens does not exist because the town requires the entire property to be fenced, and the resort’s governing condominium association bans entry by both the public and the owners. Also on Saturday, Chuck Whittall, founder and president of Orlando-based Unicorp National Developments, said the company is making progress in its plan to build a 166-room-hotel, 78-condominium St. Regis Hotel and Residences at the site. The Town of Longboat Key approved the Unicorp proposal in mid-March. The company already owns about 67 percent of the condominiums as well as 95 percent of the recreational and commercial property. Other lawsuits, one filed by Adams, one by the Rabins, contend that Unicorp must have the consent of all owners and lien holders as state statutes require. But Whittall is proceeding with a lawsuit that would strip the holdout owners of the ability to halt the redevelopment of the property by dissolving the condo association without its members’ consent on the grounds that the property is decrepit and a threat to public safety. A favorable ruling on those grounds would supersede the usual procedure that requires 95 percent of the members to agree to terminate the association. The association board has already signed a development agreement with Unicorp. But Whittall’s suit seeks “judicial termination,” Lobeck said. The statute that allows that kind of termination also requires a public sale. Whether Unicorp would accept the highest bid to gain control of the property is a matter of conjecture. At one point, Whittall offered to pay $170,000 for each condo, with an extra $100,000 for units in the midrise building and a $200,000 bonus for beachfront units — a $40 million-plus package. Blake Fleetwood, who had been rejecting buyout offers and opposed the proposed redevelopment of the once-renowned resort, sold his two beachfront units to Unicorp in a contract signed several weeks ago. One sold for $370,801, the other for $170,851, according to public warrant deeds. Fleetwood’s contract also stipulates that he would waive his power to appeal the town commission’s decision to authorize the redevelopment of the 17.6-acre tract. He also resigned from the board of the Colony’s condominium association, relinquishing his ability to influence decisions about the property’s future. “This is a real tragedy for 237 homeowners who lost their life’s savings,” he said. Lobeck said his goal is a court ruling that forces the issue back to the Longboat Key commission.